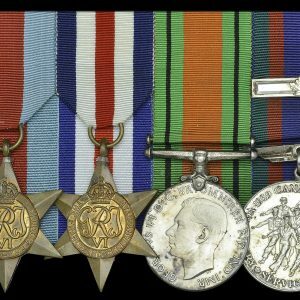 Home » Gallantry/Decorations/Lifesaving » A rare and important Companion of the Order of the Bath Stall Plate to Christopher Myers, Colonel in the Army and Deputy Quarter Master General of His Majesty’s Forces in Canada. One of only TWO with ‘Canada’ within its inscription. 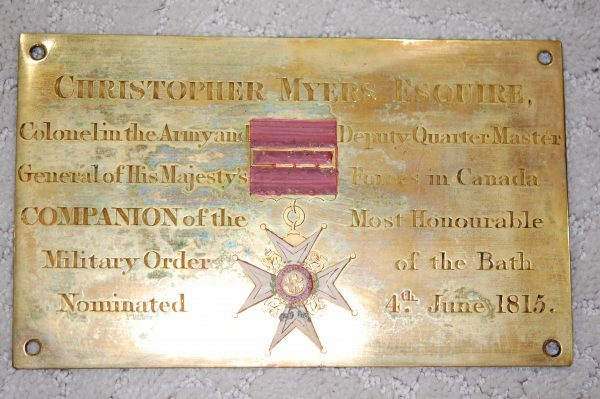 A rare and important Companion of the Order of the Bath Stall Plate to Christopher Myers, Colonel in the Army and Deputy Quarter Master General of His Majesty’s Forces in Canada. Maker’s mark stamped on reverse. VF. Christopher Myers was born in County Dublin circa 1774. He obtained his first commission as an ensign in the 69th Foot on the 11th of April 1795. In 1799 Myers, now a Captain in the 40th Foot, served in the Helder Expedition where he was wounded during the Battle of Bergen. A young Lieutenant Colonel Issac Brock of the 49th Foot as served in this campaign. In November 1804 Myers arrived in Barbados, where his uncle Lieutenant General William Myers Bart. was the Commander of His Majesty’s Forces in the West Indies, to serve as a captain in the 4th West India Regiment. Within weeks of his arrival Myers’ wife Mary had died of fever, followed by his brother James in December, and his uncle in the following July. Myers was also affected by the fever and although he recovered his health was permanently damaged. Myers was appointed Deputy Quarter Master General (DQMG) in Jamaica with an army rank of lieutenant colonel. He next saw active service at the siege of Santo Domingo in what is now the Dominican Republic. With war clouds darkening in North America, Meyers was made DQMG to the forces serving in the Canadas and arrived in time to be given temporary command at Niagara while Brock campaigned in Detroit. On the 13th of October 1812, while the battle of Queenston Heights raged, Lieutenant Colonel Myers led a raid from Fort Erie to Black Rock where his troops destroyed ammunition and infrastructure after driving the defending forces away. On his return to Fort Niagara he was greeted with the news of a great victory and of the death in action of Major General Brock. At Brock’s funeral Lieutenant Colonel Myers was designated as one of four chief mourners. At the Battle of Fort George in May of 1813 troops under the command of Myers were defeated by a vastly superior American force. Myers himself suffered at least three serious wounds and was made a prisoner of war. It was not until November that he would return to Lower Canada having been exchanged on parole for an American colonel. Myers next headed to Quebec City where he married his second wife Lydia in April of 1814. Twenty-eight days later he was released from parole and resumed duties as DQMG. Rewarded with a promotion to colonel in the army he then returned to the Niagara where he served at the siege and assault of Fort Erie, and later commanded the British forces at the Battle of Cook’s Mills for which service he was commended. 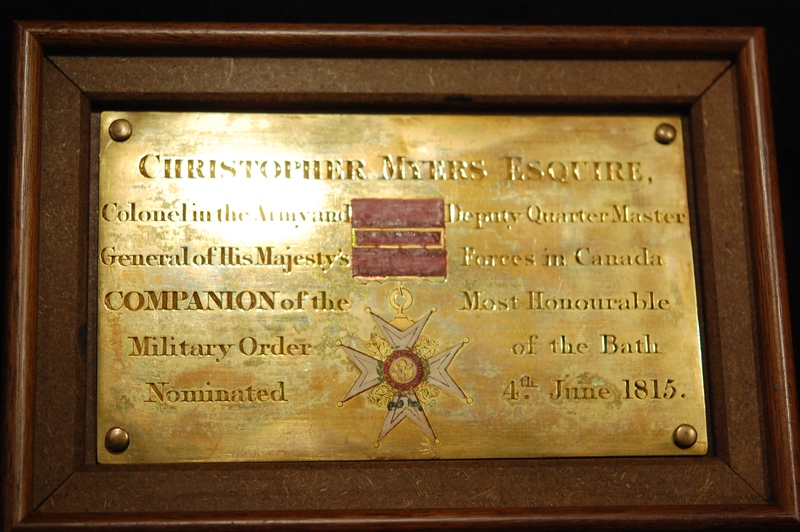 With the War of 1812 concluded Myers’ service was recognized by his being made a Companion of the Order of the Bath on the 4th of June 1815. In the fall of 1816 Colonel Myers traveled to Perth Ontario to investigate the condition of the settlers of that military settlement. The acceptance of Myers’ recommendation that the inhabitants be issued with military provisions likely prevented mass starvation. On the third of November of the following year Colonel Myers died at Montcalm House in Quebec City at the youthful age of forty-two. He is remembered through a memorial in the parish church a Cheltenham and the naming of Myers Island in the St. Lawrence River. 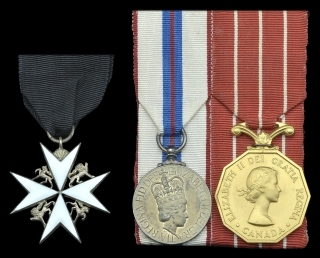 There were 227 awards of the Companion of the Order of the Bath made to officers of the army between 4 June and 8 December 1815 in recognition of service during the Napoleonic wars – in comparison to the award of 596 small Army Gold Medals. 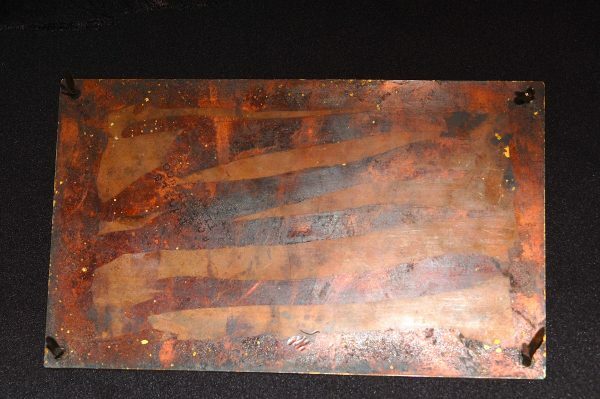 All Companions were required to pay for the construction of a Stall Plate that was to be erected in the Henry VII Chapel of Westminster Abbey to publicly recognize their service – that promise, like that of a memorial to the veterans of the Battle of Waterloo, was not kept. 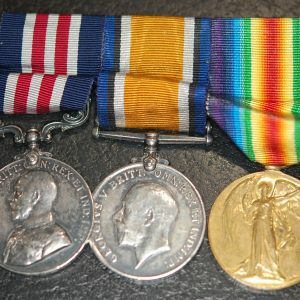 For many Companions who were not entitled to a gold medal or cross, or who did not survive to receive a retrospective medal, their Stall Plate is the sole ‘named’ recognition of their service. 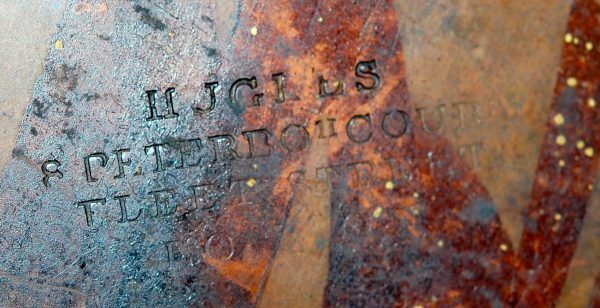 The Stall Plate to Colonel Christopher Myers is likely one of only two awarded to feature ‘Canada’ within its inscription – as such it is of the highest rarity.